Prime Minister presented vision on “Building the Thai Future 2020” which related to the Government’s mega project on infrastructure investment to make further clarification on how the people’s quality of life will be upgraded, as well as all the benefits gained from the project. October 26, 2013, at 1100hrs, at the Golden Jubilee Convention Hall, Khon Kaen University, Prime Minister and Defense Minister Yingluck Shinawatra presided over an opening ceremony of the road show exhibition on “Building the Thai Future 2020″ in Khon Kaen province held in collaboration by Ministries of Education and Transport during October 25-27, 2013. Participated in the event were Education Deputy Minister Sermsak Pongpanich, and other cabinet members, as well as Khon Kaen Governor Somsak Suwansujarit, heads of local government agencies, public, and media. 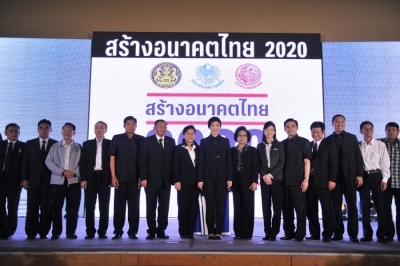 PM Yingluck stated that the road show exhibition on “Building the Thai Future 2020″ was aimed to promote and disseminate information on national infrastructure project to the Thais from all sectors, and to hear from the local people. It would highlight on how people in the area and nearby provinces would benefit from the national infrastructure project in transport both in terms of economy, transportation, and livelihood. Moreover, national competitiveness would be enhanced through the increase of revenue and opportunities, cost reduction, more equality, less disparity, as well as ASEAN and global connectivity which would eventually draw more investment to the country. National economy would be pushed forward. Prosperity would be spread from the capital to other provinces. All of these would ensure economic value added at an immense scale in the long run. PM Yingluck emphasized that the Government intended to develop national infrastructure projects through the Act empowering Ministry of Finance to acquire up to 2 trillion Baht in loans for infrastructure development to ensure the continuity of the projects regardless of the future change of governments. PM Yingluck also stated that the Government has laid out a strategic plan for the central Northeastern provinces to be the distribution centers and future hubs for logistics, trade, and investment. Khon Kaen province will be the hub for large-scale agro-processing. Kalasin province is planned to be the hub for pre-historic tourism. Mahasarakham will be the hub for cultural and historical tourism as well as an educational center. Roi Et is planned to be the hub of high-graded Hom Mali rice production. In addition, OTOP products of each locality will be promoted and showcased in the global markets. Not only that, convenient transportation will reinforce family bond since people from the local areas such as in Khon Kaen will no longer have to work or stay far from home as before. PM Yingluck, then, visited parts of the exhibition before moving on to Khon Kaen’s Muang Kao sub-district where she worshipped Buddha Wang Mont Buddha image and was briefed on the flood situation of the area. The road show exhibition is composed of 4 zones: Zone 1- Exhibition on the Government’s 2-trillion Baht projects, high-speed train project, dual gauge railway, 4-lane road network, and an exhibition on how Khon Kaen and the nearby provinces would benefit from the projects; Zone 2- sessions for public dialogue; Zone 3- varieties of activities; and Zone 4- sales of OTOP products.